Students are walking out of class across the country to protest gun violence and the government’s failure to pass meaningful gun control legislation. The National Walkout Day was organized following the school shooting a month ago today in Parkland, Florida, claiming the lives of 17 and injuring many more. Students from Parkland have already shown themselves to be eloquent and fierce voices in the debate to end mass shootings, but this mass action now sends a clear message that they intend to do more than just deliver speeches. The demonstrations are intended to put increased pressure on Congress, and the White House, to finally take real action on this country’s gun problem. This protest will be followed up on March 24 with the March For Our Lives rally, taking place in Washington, D.C. and in cities nationwide. 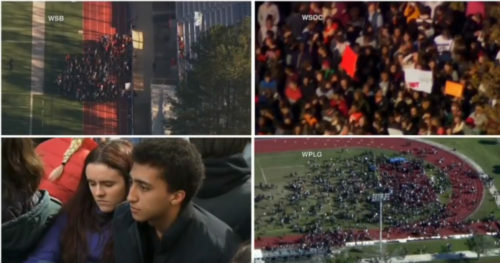 Here is some live footage, and reactions, from the demonstrations, taking place throughout the day. Share your experiences in the comments below. MS Douglas High survivor vows to vote against anyone who doesn't support an assault weapons ban. #IWillMarch to demand the change from those who should be representing the people, not the gun manufacturers filling their pockets. Our politicians work for us and they are failing us. We will defend you. We are fighting for you the same way we are fighting for everybody else. Thank you for voicing your opinions. #IWillMarch to push legislation that should’ve happened years ago, will you join us on March 24th?? One month ago today, we were all changed. #IWillMarch so no child has to lose their innocence like we did. #IWillMarch so my children don’t have to experience what we all went through.#IWillMarch because my generation—the mass shooting generation—has had enough. #iwillmarch because I want the NRA to fear the vibrations of the people’s stomps across the nation.